Pradhan Mantri Mudra Yojana (PMMY) Scheme, It was announced by the Hon’ble Finance Minister while presenting the Union Budget for FY 2016.MUDRA, which stands for Micro Units Development & Refinance Agency Ltd, is a financial institution beingset up by Government of India for development and refinancing micro units enterprises.The purpose of MUDRA is to provide funding to the non-corporate small business sector through various Last Mile Financial Institutions like Banks, NBFCs and MFIs.envisages providing MUDRA loan, upto ` 10 lakh, to income generating micro enterprises engaged in manufacturing, trading and services sectors. The overdraft amount of ` 5000 sanctioned under PMJDY has been also classified as MUDRA loans under Prime Minister MUDRA Yojana (PMMY). Under the Pradhan Mantri MUDRA Yojana, three types of loans are offered. What is the eligibility of persons for availing Mudra loans? Any Indian Citizen who has a business plan for a non farm income generating activity such as manufacturing, processing, trading or service sector whose credit need is less than 10 lakh can approach either a Bank, MFI or NBFC for availing of MUDRA loans under PMMY. The usual terms and conditions of the lending agency may have to be followed for availing of loans under PMMY. Interest rates are to be charged as per the policy decision of the bank. However, the interest rate charged to ultimate borrowers shall be reasonable. Scheduled Commercial Banks, RRBs and Cooperative Banks wishing to avail of refinance from MUDRA will have to peg their interest rates, as advised by MUDRA Ltd., from time to time. 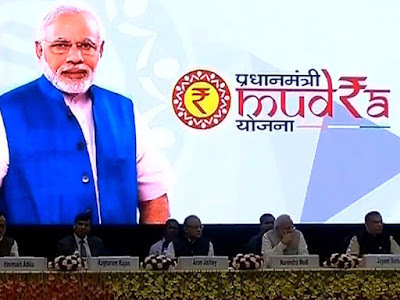 How to apply Mudra loans under Pradhan Mantri MUDRA Yojana (PMMY) ? Proof of identity - Self certified copy of Voter’s ID card / Driving License / PAN Card / Aadhar Card/Passport. Proof of Residence - Recent telephone bill, electricity bill, property tax receipt (not older than 2 months), Voter’s ID card, Aadhar Card & Passport of Proprietor/Partners/Directors. Proof of Identity/Address of the Business Enterprise -Copies of relevant licenses/registration certificates/other documents pertaining to the ownership, identity and address of business unit. Project report (for the proposed project) containing details of technical & economic viability. Memorandum and articles of association of the company/Partnership Deed of Partners etc. In absence of third party guarantee, Asset & Liability statement from the borrower including Directors& Partners may be sought to know the net-worth. Photos (two copies) of Proprietor/ Partners/ Directors. please contact your bank, ask mudra loan details, he/she will be explain all details about Mudra loan, and ask mudra loan application form in your bank.